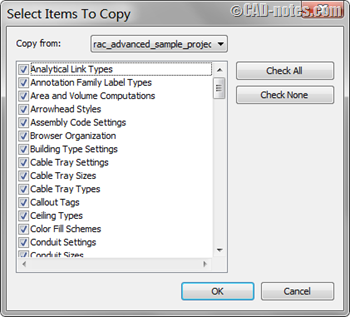 Can we copy settings from one Revit project to another project? Not only project settings, we know that some families are saved in Revit project. Stairs and railings can’t be saved as external Revit families. Copy settings is very useful to copy styles or families to our current project. 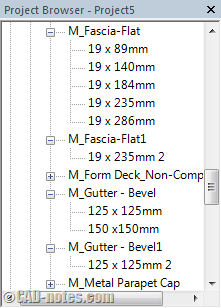 And this would be very useful to create a Revit template from a completed project. Yes, Revit has a tool for that. It’s the Transfer Project Standards tool. To use this tool, you need to open both the source project and target project. Activate the target project file, where you want to copy the settings. Go to Manage Tab> Settings Panel> Transfer Project Standard. Click the icon to activate Transfer Project Standards tool. Revit will open a dialog box to perform this operation. If you open more than two projects, you can choose from which project to want to copy the settings. By default, this tool will copy all settings. Uncheck the types you don’t want to copy. If you have settings and families with the same name in target project, you will see this warning. 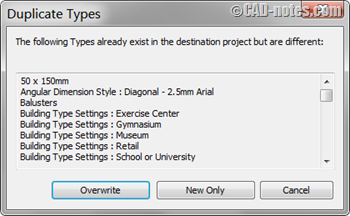 If you want Revit to ignore duplicate types, choose New Only. But if you want Revit to overwrite the existing types, choose overwrite. After you copy the settings, Revit may show warning below. 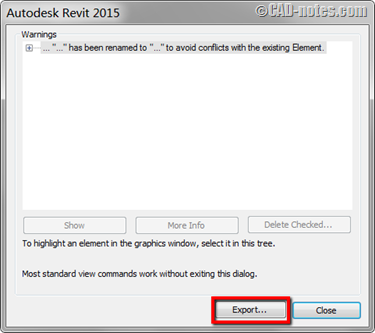 Revit create a copy and rename it to avoid conflicts. We don’t want to see duplicate families with automatic suffix in our family types, so we need to save the conflicts list. Now you will see a dialog box is opened. Click Export at the bottom of this dialog box. Type a file name for this file and save it to your preferred location. The file is an html file, and you can open it with any Internet Browser. Open it to examine the conflicts. Now based on the warning log, find the families in Project Browser. As you can see below, we have some duplicate families in the browser. Examine the families types, and you can delete what you don’t need. Now you have the settings and families in your current project. You can repeat the procedure if you want to copy settings from other projects. How does the Autodesk Subscription license affect you? Have you purchased Autodesk Subscription? How is your experience with the new licensing model? Do you like it better than the old model? Let’s hear your experience!